Land animals - Visual Dictionary - Copyright © 2005-2016 - All rights reserved. [img]https://infovisual.info//storage/app/media/02/img_en/079 Different land animals 2.jpg[/img] [url=https://infovisual.info/en][/url] - [url=http://www.infovisual.info/]Visual Dictionary[/url] - Copyright © 2005-2016 - All rights reserved. 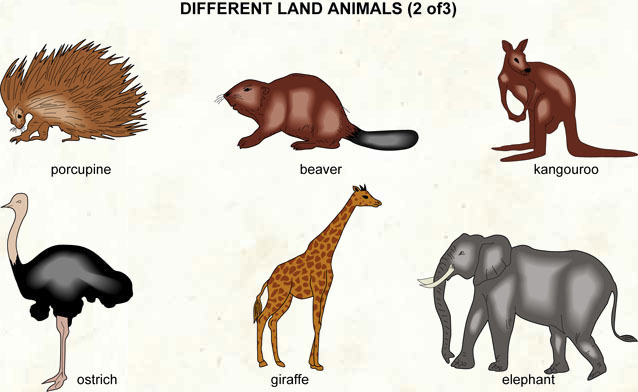 Different land animals (2 of 3): animals living on solid ground. Porcupine: nocturnal animal armed with dorsal quills. Beaver: mammal of the rodent family, native to North America and Europe. Ostrich: large running bird whose wings are not suited to flight. Giraffe: African mammal with a very long neck. Elephant: huge ungulate mammal, with Asian and African varieties.